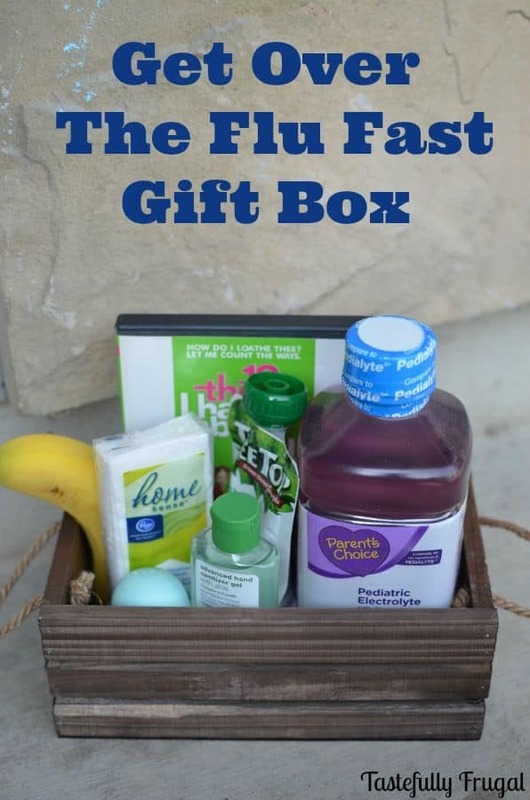 If you know someone who has come down with the flu, drop off this feel better flu gift box to help in a speedy recovery. Hey Creative Ramblings readers! Sydney here from Tastefully Frugal. We’re coming up on one of my favorite times of the year. It’s also one of the times of the year when I don’t like leaving the house. Yes, it’s cold; but also I am that crazy paranoid mom who doesn’t want her kids getting sick. We’ve been lucky these past three years; minor colds have been all we have caught, and I hope to keep it that way. Unfortunately, we’ve had some loved ones who have already fallen victim to the flu this year. When you have the flu you don’t even want to get out of bed, let alone even think about eating, drinking or doing anything else. But to keep your body safe and get on the road to recovery fast you need to rest, stay hydrated and keep some sort of food in your system. The best way to do that is to stick to the BRAT diet; Bananas, Rice, Applesauce, Toast. Knowing how miserable it is to have the flu, I put together a feel better flu box for a friend who recently came down with the stomach bug. 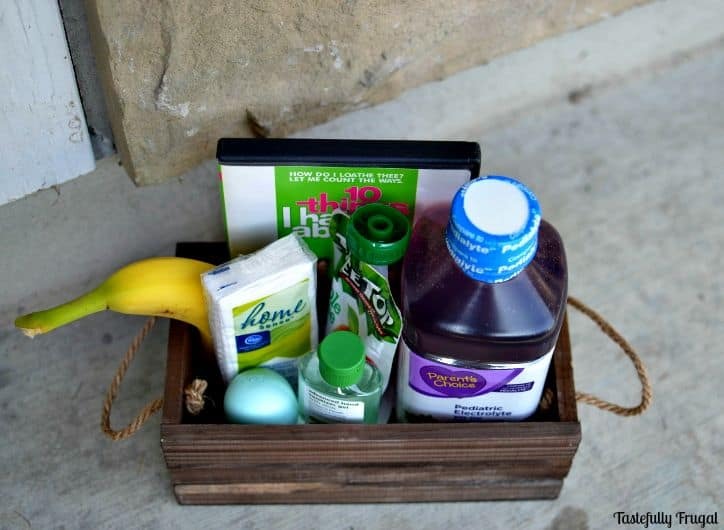 I included a few staples of the BRAT diet, bananas and applesauce packets as well as a few other essentials. 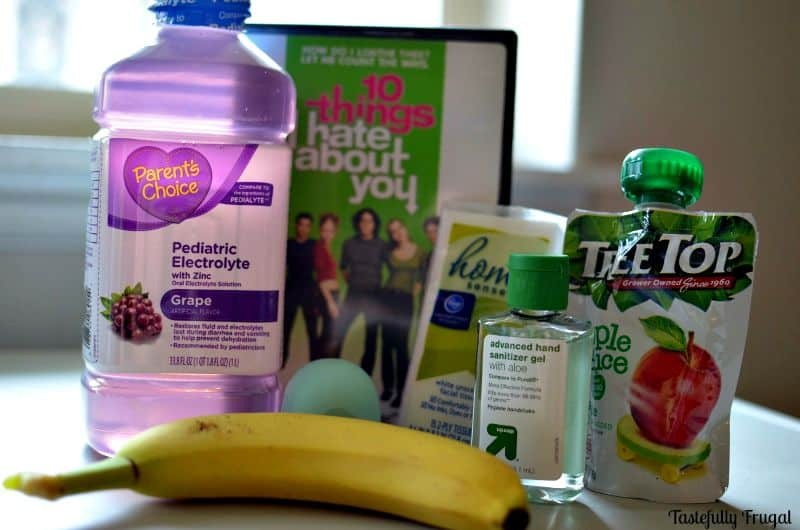 Tissues, hand sanitizer, lip balm, pedialyte (the best way to keep yourself hydrated. You need more than water and sports drinks are packed full of sugar which isn’t good for you either) and a movie to watch. I always find I fall asleep faster and stay asleep if I have a movie on in the background. Some of my favorites are Hope Floats, Pretty Woman and 10 Things I Hate About You. Sometimes it’s the little things that can make all the difference and this little gift cost less than $10 to put together and really helped my friend get on to the road for recovery. Knowing that the flu season is right around the corner, I’m stocking up on tips and tricks to fight it as well as recover from it quickly. What are your best tips for fighting the flu? For more gift ideas and inspiration for the upcoming holidays be sure to follow me on Facebook and Instagram.